Send your gift recipient on a tour of the world's great vineyards with this 3 bottle wine gift basket, featuring three recent Wine of the Month Club Selections. Our exceptional wines have been hand-picked from among the hundreds of wines tasted and compared by Cellarmaster Paul Kalemkiarian each month. 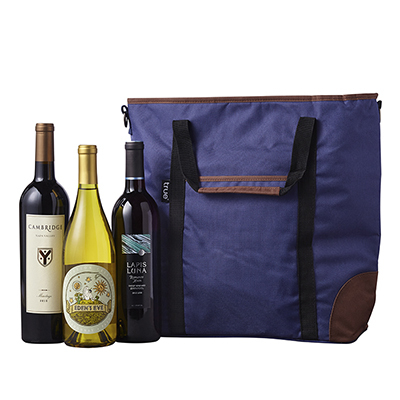 Keep drinks cold on the go with this large insulated wine bag, sporting an ample front pocket and removable shoulder strap. Lined with food-safe PEVA, it holds up to three standard wine bottles.